The so-called “Apple Cider Vinegar Diet” is sweeping social media, but does it work? BEVERLY HILLS, Michigan — The so-called “Apple Cider Vinegar Diet” has been all over social media for years — but does it work? 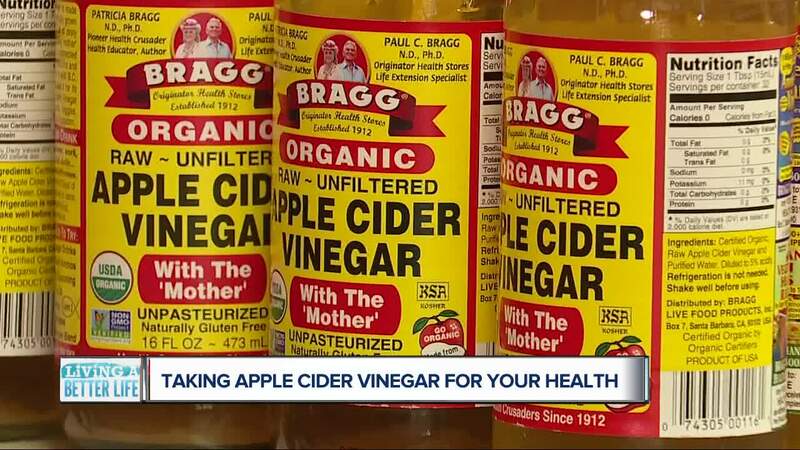 The hashtag #applecidervinegar has 280,000+ posts on Instagram – showing how it can help with everything from skin care to hair health to blood sugar control to digestion --even weight loss! Bottles of the stuff sell very well at Better Health stores in metro Detroit. “Oh, it’s very popular. In fact, we had to move it from the main aisle. We had to dedicate a whole end cap to it because it sells so fast that we’d actually be refilling the shelf every couple of hours,” said Jerry Butler, Store Director of Better Health in Beverly Hills. Jeanette Rodgers of Southfield, Michigan buys it up. The 57-year-old has been drinking diluted apple cider vinegar every other day in the morning for the last 5-to-6 years. “The biggest benefit is in the gut. Burn that fat,” said Rodgers, patting her flat stomach. The active ingredient is acetic acid -- that murky cloud you see in unfiltered apple cider vinegar. Basically, it’s friendly bacteria…plus proteins and enzymes. “You can see it kind of pooling down at the bottom. So, it’s important – especially with the Mother -- to give [the bottle] a good shake,” said health and wellness expert and author Cassie Sobelton of Birmingham. She’s been incorporating apple cider vinegar into her diet for 15-to-20 years. “I really started my process using apple cider vinegar when I found out about my Crohn’s disease and different digestive issues that I had. And this helped me tremendously,” explained Sobelton. She said health benefits include controlling blood sugar levels, oral health, digestive health, balancing the body’s pH level and more. She also uses a swab of the diluted vinegar to clean her dog’s ears to help prevent ear infections. Outside, she sprays the solution on weeds in the yard to kill off the top-growth (the roots will survive). But as for human use, she admits apple cider vinegar is not a cure-all and should not be used as medicine or to replace insulin. Experts at Harvard Medical School and the Mayo Clinic point out using apple cider vinegar can interact with certain supplements or drugs – including diuretics and insulin. So, people with diabetes should be cautious. And studies of apple cider vinegar consumption for weight loss in humans have not shown consistent or compelling results. Truth in reporting, I tried a shot of the stuff straight. But it caused a burning sensation in my throat for the better part of a day. It went away with no apparent lasting negative effects, and my digestion did seem to get a boost. However, after that experience, I would recommend not drinking it straight. Plus, undiluted apple cider vinegar can erode the enamel on your teeth. As another option, I measured out 1-to-2 tablespoons and then diluted it with 8-ounces of water. Stir, add ice and drink. If you need a sweetener, a splash of apple juice or some honey works well. The most common recommendation is one-to-two teaspoons in water taken before each meal. Bottom line – if you’re thinking about trying the apple cider vinegar diet, there’s not extensive science to back it up. But consuming apple cider vinegar in moderation (i.e. diluted drinks or salad dressings) should not hurt you and may even make you feel better.